Email, text, call or chat: Tell us your child’s challenges, talents and diagnosis (if available). Or simply request that we reach out. Our staff responds promptly. Visit: A two-person expert team tours the facility with your family. They speak with you and answer questions while also observing and interacting with your child to begin assessing needs. Send: Send background information if you have it: diagnoses, reports, assessments, therapeutic plans and more. Background is helpful but not required for enrollment. Assess: We recommend and schedule additional assessments if necessary. Outline: We outline your child’s program using information from visits, background and assessments. We also investigate additional assistance options. We’ll contact you to discuss the outline. 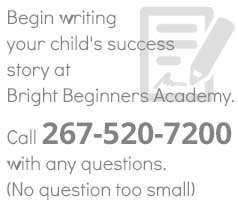 Enroll: Your child’s success story opens at Bright Beginners!